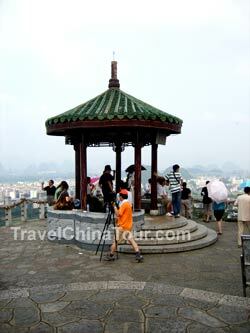 My next stop was Diecai Hill in Guilin. Diecai Hill is located northeast of Guilin very close to Lijiang (Li River), and it is one of the more popular mountains that attracts many tourists. The thing about Guilin is that there are moutains (or hills) all over the city, and most of them are a tourist attraction, and since you can't climb them all, just go for the more popular ones. Diecai Hill is also known as the Folded Brocade Hill. It is formed by limestone and gray rock, and the name Diecai means "folded brocades", which originated from an essay written by Yuan Hui, a famous write of the Tang Dynasty. Diecai hill consists of several peaks named: Yuyue Hill, Siwang Hill, Crane Hill, and Bright Moon Hill (which is the tallest). 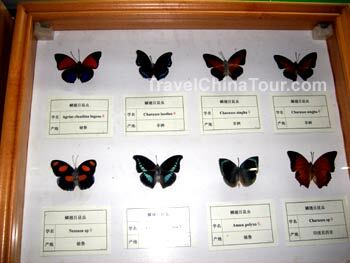 on the climb up to the top, there’s a butterfly museum, which has many types of butterflies on display, and they also have many for sale. At Diecai hill, there are many peaks which you can climb, but the "Bright Moon peak" is the highest peak, and that is the one I decided to climb. Diecai Hill is also well know for its stone carvings. 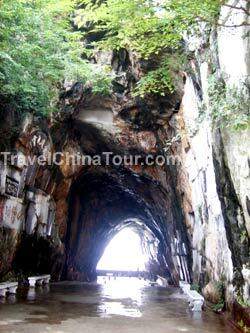 During the climb, you'll come up to a large cave, and carved at its entrance in large Chinese characters is "Diecai San" or Diecai Hill. 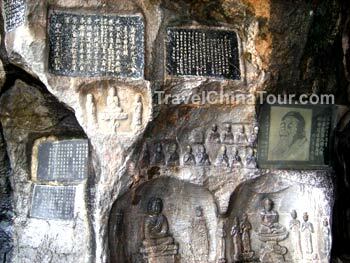 On the walls are various stone carvings of Chinese writings and buddhas. Close up photo of the carvings on the mountain side. Since the Bright Moon Peak is the tallest at Diecai Hill, I decided to climb it first. It was about a 15 minute climb, and rather tiring in the humid heat. Some parts of the climb were quite steep, and I would suggest wearing something light, with runners, and bring plenty of water. By the time I got to the top, I was so wet that I don't know if I was drenched in my own sweat or from the humid air, or both! I could litterally squeeze sweat out of my t-shirt. located on top of the bright moon peak. During the climb up, there was a photo service where you can get your pictures taken with peacocks. Once at the top of the Bright Moon peak, you arrive at the Cloud Catching Pavillion, and you get a clear panoramic view of the entire Guilin City. 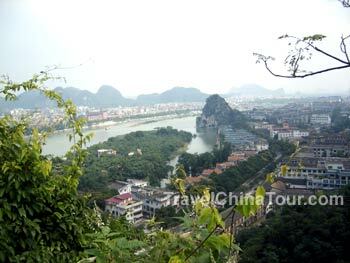 A view from the top of Guilin City. The mountain peak you see in the distance (about 3km away) is Fubo Hill, which was going to be my next destination. After spending a little time enjoying the scenery on top of Diecai hill, and catching my breath, I descended down, and headed towards another peaked called the Crane Peak,which has a large cave named the Crane Cave. But on the way to the Crane Cave, there was a large enclosed area filled with all types of exotic birds, most of which I don't know the names to. ;) It was about a 15 minutes climb to the Crane Cave. The Crane Cave is a gigantic cave that's more like a tunnel, since it has an opening at the other end. Inside the cave was cool and breezy. The Crane Cave at Diecai Hill. The Crane Cave is located at the halfway point of the Crane Peak. It's 14 meters high, 60 meters long, and 8.9 meters wide. 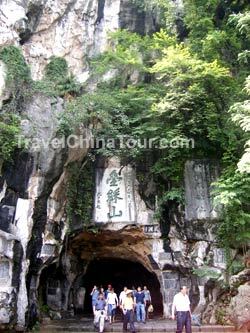 Interesting information: the information board at the Crane Cave mentioned (only in Chinese), that during world war 2, the Crane Cave acted as a natural bomb shelter, and housed Guangxi province's telecommunications. After I finished touring the Crane Cave, I didn't feel up to climbing all the way up the Crane Peak. Also, this part of Diecai Hill is a bit deserted, since most of the tourists go for climbing the tallest Bright Moon Peak. At this point, I headed back down the mountain to goto my next destination.